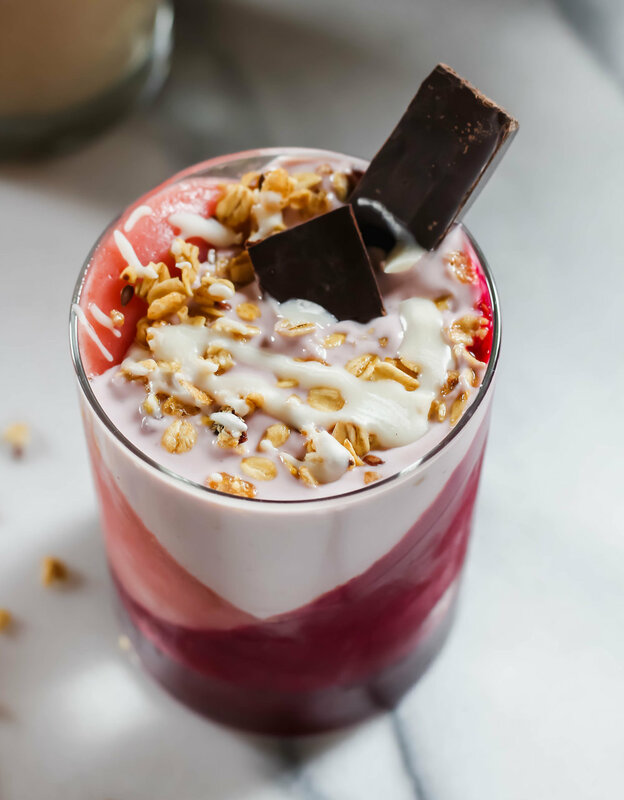 Sometimes you just need to make a fancy smoothie. It feels good, it taste good; it's just so good all around. I don't really celebrate Valentine's Day so fun treats like this is my own way of celebrating. I hope you'll join me! I recommend beginning to make this smoothie the day before you plan to eat it. It's not one that you can just whip up in a few minutes but I have to say, it's totally worth it! Blend together milk, banana, and vanilla. Pour 1/2 of the smoothie into a separate cup. Blend the remaining with the beet. 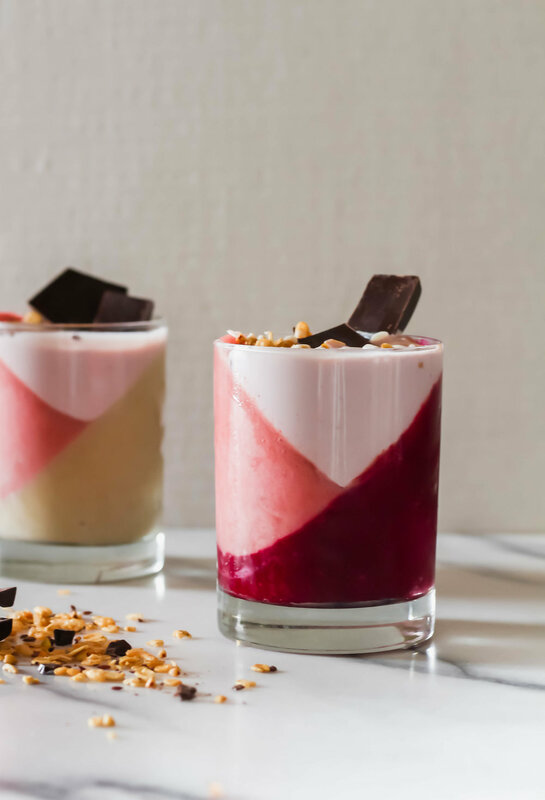 Taking two different glasses, pour the different smoothie mixtures into separate glasses while having them tipped on their side. Once filled, place the tipped glass in the freezer for 4 hours. Make sure that you have the glass in a place that it won't tip or move or it will mess up the process of freezing it. Once frozen, remove from freezer and make the second portion of the smoothie. Blend milk, strawberries, and banana together. Tip the glasses the opposite way and fill with smoothie. Place back in freezer until frozen completely, probably another 4 hours. Remove from from freezer and fill the center with yogurt. 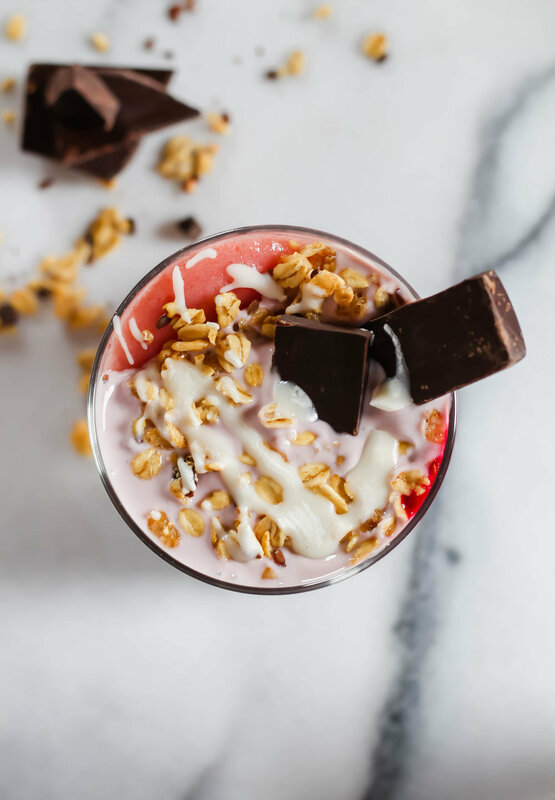 Top with granola, drizzled coconut butter, chocolate, and whatever else you desire. Serve, enjoy! Let me start off by saying that this isn't actually a recipe. It's just something that I thought that I'd try and found out that it was too good not to share. I'm not affiliated with the kombucha brand, Kevita, listed below. They just happen to have a "Roots Beer" flavor that I thought would be awesome to share in this way. Now that all of the general PSA's are out of the way, let's talk kombucha floats. I stopped drinking pop (or as people who don't live in western PA say it - soda) probably 6 or 7 years ago. I can't really remember when I cut it out for good but I know it's been quite some time. I didn't really miss it much, as it is for most things that disappear from my diet due to my personal choices, and once I found kombucha my love for carbonated beverages developed once more. It wasn't love at first sight, no way. The first few times I tried kombucha I couldn't understand how people enjoyed such drinks. Yuck! That was 5 years ago and shortly after being disgusted by it I just kept buying it. Although I don't even know why since I didn't like it. But hey, it worked out and now I'm on a one a day habit. Yes, one a day. I mean, the way I look at it I could have a daily habit of consuming much worse things and I can afford it; so it's just going to keep on happening. And when you drink something pretty much everyday you start to wonder what all you can do with it. Hence, the kombucha float idea. Putting two of my loves together into one large glass to create a special kind of magic. It's good you guys, so good. I haven't tried other flavors yet, but I plan to. This is going to be my dessert of 2018. I'm calling it right now. 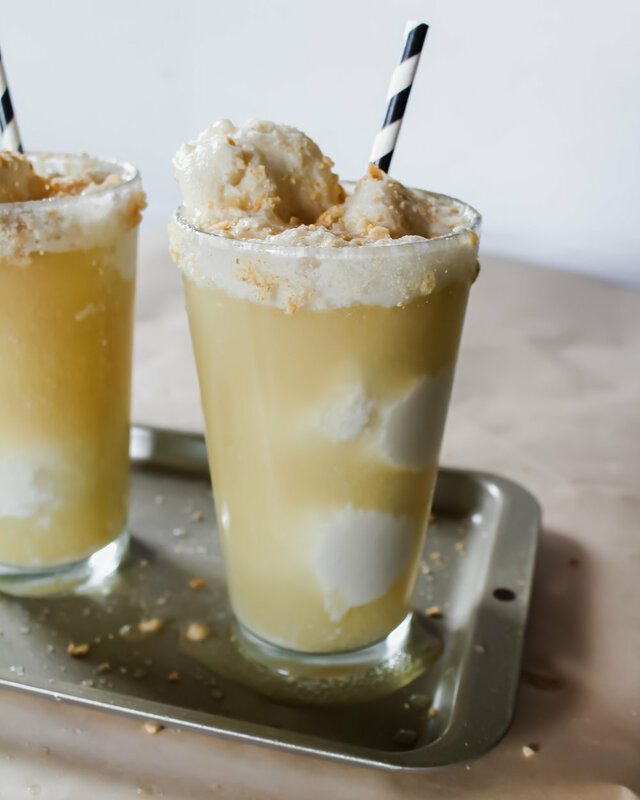 Scoop the ice cream into a glass and add in the kombucha. Serve, enjoy! I just have to start this post by sharing this song with you because it takes over my head space when I think of hot chocolate. I don't know why, I don't know how - all I know is that this is my reality now. An unintentional rhyme and a song all in the first two sentences of this post. You know it's gonna be good! I'm not really into hot drinks, to be honest. But when chocolate is involved it's pretty hard to say no. 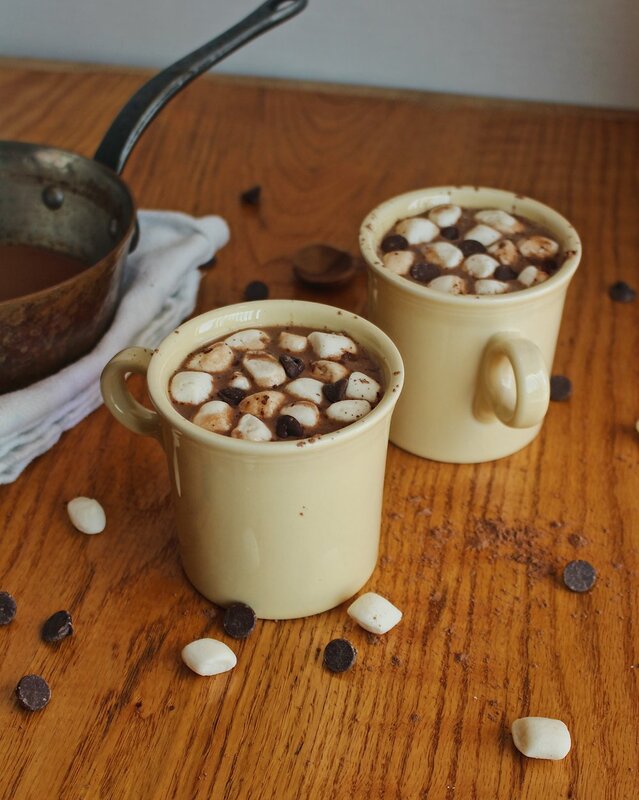 Not only does this hot chocolate come with a rich chocolatey flavor, it also has a few adaptogens in it too. Winner, winner vegan dinner! I hopped on the adaptogen train at the beginning of this year and don't plan on getting off of it any time soon. I am hooked! I'm really digging ashwagandha and maca lately. Ashwagandha helps to chill us the heck out, reduces inflammation, balances hormones, along with a ton of other things that you can read in a quick Google search. Maca helps to balance hormones, boosts the immune system, increases energy, along with... you guessed it, a ton of other things that you can find in a simple Google search. Adding these guys to this hot chocolate means that we can drink up all of the benefits from these amazing adaptogens without even knowing that they're there. With the chilly weather and holiday season officially upon us, the perfect way to relax a bit between all of the stress ('tis the season) is to make a big batch of this, sit down, and rewatch Shameless, Breaking Bad, or your favorite holiday movie, if you're into that type of thing, on Netflix for a few hours. Fun! Delicious! Yay, December! I am always fascinated by vibrant colors of fruits and vegetables. I can eat them time and time again and without fail I always sit there thinking that nature is the coolest thing ever. Because, well it is! I'm feeling super good lately, buzzing around fueled by the sun. Spending more and more time outside and gearing up for the months of adventures ahead. I decided that this year I want to plant a garden. I'm ready to give it a shot! I need to buy my seeds and do some research but I am so excited to be able to make smoothies from fresh foods that I grow myself. I don't think we put a lot of thought into where our food comes from and I want to know where my foods come from. It's just a disconnect that I want to try to take a step back from and see how it goes. I'm planning on doing more farmers shopping once they start up again in May and attempting a garden of my own. I'm excited to see how it goes. Any tips on gardens or what I should grow? Let me know! Okay guys, I have a new obsession. Homemade cashew milk. How in the world have I went this long without making my own cashew milk?!? If you've never made your own cashew milk before then you are missing out big time. I think a lot of the reasons why I never attempted to make milk at home was because it seemed kind of intimidating and time consuming. Making my own milk, who has time for that?! And just... how!? Well, it's actually very simple and a pretty quick process, too. It's so much creamier than store bought milk. It makes killer teas and is a great addition to oatmeal. But you can never go wrong with drinking it straight out of the bottle either. I got inspired to give this a shot when I was digging deeper into my stomach issues and realized that a lot of the store bought milks have all kinds of unnecessary things put into them. I thought that maybe that was contributing to my digestion problems so I took matters into my own hands and figured out that making my own milk isn't hard to do after all. a space for stories, photos, and connection that goes deeper than the screen. everything on this site is create by me, amanda. i'm so happy to have you here.